We've fallen head over heels in street-food-nerd-love with the amazing vegetarian Indian goodies at Taj Sweets & Restaurant in Harris Park. Teetering on the edge of the creeping bulge of Parramatta, Harris Park has a friendly, laid-back family vibe. As always, we arrive unresearched and wander around to see what looks good. There's a few restaurants that look too 'restauranty' for us. Taj Sweets & Restaurant looks perfect, it screams 'Street Food!' It's packed with Indian Australians and there's not a table cloth in sight. Inside is squeaky clean, but we won't hold that against them. The folks that run this place are wonderfully warm and friendly, and so are the customers for that matter, there's something peaceful and calming about this place. It's an 'order at the counter, take a number' joint. The menu is in English but not overly descriptive, if you're like us and don't know a lot about Indian food then have a look at the menu on the web and google some of the dishes before you go. Traditional salt lassi yoghurt drink $3, lightly spiced with a slight curry flavour, most interesting. Along with a traditional Indian Diet Coke. Shawn is addicted to Diet Coke with dinner - the chemicals strip the palate clean and the toxic acids clean the mouth of oil. George Costanza is right, Pepsi is better than wine. Dahi Bhalle - lentil donut soaked in homemade yoghurt, served with a topping of boiled chickpeas, potatoes, onions, red tamarind and mint sauce with authentic spices - $6.50. Southern Indian thali - $13.90. A hearty serve of colourful basmati rice with four different curries, fresh chopped veggies, a pot of yoghurt with rice bubbles and a lovely yellow cake soaked in sugar syrup for dessert. Served with fresh flat bread and a surprisingly spicy pappadum. Today's special - puri sabji - $8.90 - fresh flat wheat bread with a potato and lentil curry, pickled veggie and red onions. The breads seem to be a really speciality here. Rava masala dosa - a large crispy flat bread filled with a filling of lightly spiced potato. Rava dosa is made with semolina and is heartier and less delicate than the rice and lentil flour base dosa we are used to. Highly recommended to dosa fans. Paneer kulcha with pickles and gravy - $10.90. Two pieces of naan-like flat bread filled with cottage cheese and melted butter of ghee on top; with lovely creamy tomato dipping sauce that's very similar to butter chicken, with some pickles for flavour. Inside the bread is a smattering of cottage cheese and flavourings. 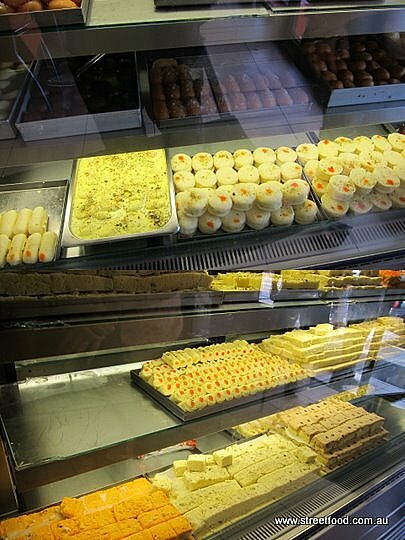 There's a couple of dozen different types of Indian sweets here. We 're totally overwhelmed with choice (and calories) and leave it for next time. And man, there will be a next time, we love this place. The food here is just superb. It's a long long long time since we've had good vegetarian Indian food so forgive us if we're overexcited. Taj's dips and curries seemed to be cooked with such skill and care, with different layers of flavours in every perfectly balanced mouthful. And the breads, oh the breads, they're incredible. High recommended. Oooh I've walked past there but haven't gone in, shall have to go on the weekend. I love going to Ginger Indian Restaurant just across from there at number 94 Wigram (http://www.gingerindian.com.au). More restaurant-y but great food and fantastic service. Every time we've been there the wait staff and the chef have all gone into detail about the food, very passionate and knowledgeable and will give advice to balance out the selection of curries. Their vindaloo is fantastic, hot but not the insanely burning kind (had a long discussion with one of the staff about this one day when I commented about the heat). The food is so good and I don't tend to get that sickly full feeling like some other restaurants. Thanks for the tip on your favourite. We are keen to investigate some more of the tablecloth -y places as some stage, they sound really good. May I also suggest Billu's, it has a bit of a legendary status amongst Parramattaians. 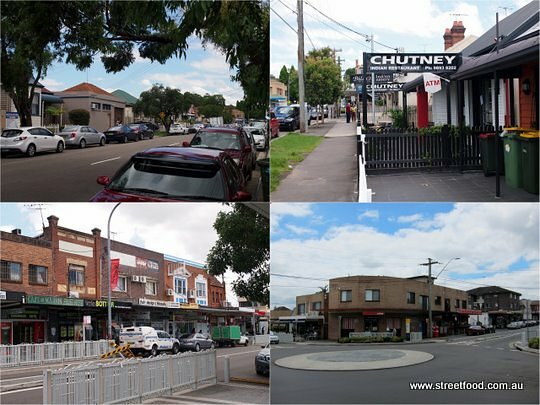 The folks that run this place also run a chain of Indian eateries called 'Taj Indian Masala' (in Homebush, Parramatta and Mount Druitt) that have similar dishes to the Harris Park store, as well as meat based curries and some Indian Chinese dishes. Wow.. love a good Dosa.. I must try this place out.